The SDK does not employ the use of graphics image. Instead, it uses pure HTML tags/code for generating and printing the barcodes. This overcomes typical problems associated with the generation of images on the client (browser), e.g. limited support of the Data URI feature in specific versions of the browsers. The HTML Barcode SDK is based on the popular barcode solution engine developed by ConnectCode and is trusted by many fortune 500 companies around the world. Our company has helped many organizations clear their independent barcode verifications and thus have the expertise and knowledge to create the highest quality barcodes. This important knowledge is manifested in all our barcode products including the HTML Barcode SDK. For example, the implementation of the minimum bar width is one area user can look for on the quality of a barcode engine. The minimum bar width is a parameter that appears in most barcode specifications. It specifies the minimum width of a vertical bar of the barcode. When there is a space constraint, some barcode engines choose to reduce the bar width of some of the vertical bars by one pixel or two to fit the entire barcode into the bounding width. Though the barcode looks ok on the eye, it results in a barcode that is not of the highest quality to the barcode scanner. Compared to these engines, the ConnectCode HTML Barcode SDK engine always uses the same bar width for each of the vertical bars to ensure the highest quality barcodes. 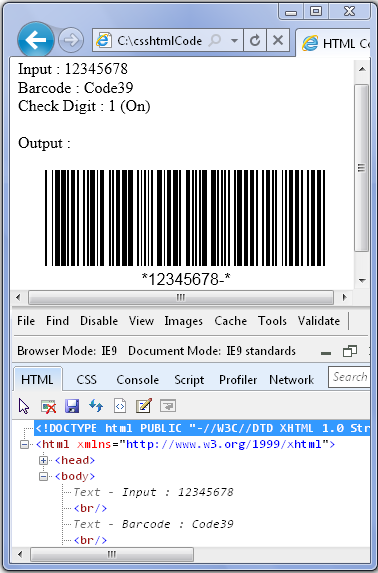 The HTML Barcode SDK uses pure HTML and CSS for creating the barcodes. Unlike other HTML barcode solutions in the market, it does not require the end user to enable background printing in the browser. It also does not employ additional embedded images which can cause problems on some specific browsers. Though some older browsers are not listed, they are likely to work with the SDK as well.